I'll admit that when I first heard that Revlon were introducing a new range of scented nail varnishes I thought they might be a bit gimmicky. Then I saw pictures popping up of the new bottles and well, hello beautiful! I've had my eye on three shades, and even though Boots currently have these on 3 for 2, I've been very good and hadn't bought any (which believe me has taken considerable constraint!). But when I discovered I could combine London Beauty Queens amazing free Models Own nail varnish offer (which is no longer available I'm afraid) with the Boots 3 for 2 and grab a bargain order, I was online quicker than you can say scented nail varnish! I arranged for my Boots order to be delivered to my local store and when I received a text message confirming it was ready to collect I headed down to grab it. The lady on the till asked me if I wanted to check the parcel but I thought it would be fine so said no and headed off. Once I got in the car I decided to open it (I couldn't wait until I got home could I!) and now I'm glad I did as the smell when I opened the envelope and the amount of nail varnish that evidently wasn't inside a bottle any more indicated something had gone wrong! The Revlon and Models Own nail varnishes were in a small clear bag together and for whatever reason (probably because Mr delivery man wasn't very careful) the top of the Revlon bottle had clean smashed off and obviously the contents just flowed out into the bag. The third product wasn't affected at all and the lady on the till quickly ran over and grabbed me a new Revlon nail varnish from the display in store. But then we were left with the problem that my local store is a smaller one and they don't actually stock Models Own and the Models Own varnish was completely covered in the stray Revlon varnish. A shout out to India though (the lady on the till from my local store) who headed off to clean up my messy varnish bottle and returned about 5 minutes later with a completely clean bottle. Overlooking the scented side of these nail varnishes I think a big selling point for these will be the beautiful little vintage perfume type bottles they come in. I mean just look at it, such a pretty little bottle! You can probably see in my pictures that the lid on mine doesn't quite screw down flat, it's slightly wonky, but this isn't a problem as it appears secure (unless put in the hands of a delivery man!). I knew from my parcel that this did actually smell quite nice, but when you sniff it in the bottle it does small like a normal nail varnish. When I first opened this I was slightly disappointed that the brush looked so thin, thinking it might take a while to try and cover my whole nail, but actually it works fine and I quite like the brush. The formula is not too thick or too thin in terms of consistency, but the colour itself is reasonably thin. On the pictures above I've applied two coats, but you can still just slightly see the line of the white of my nail through the colour, so three coats would probably be best. In terms of the colour, I would say this is a juicy looking red/orange watermelon type colour. Definitely very pretty for the spring/summer in a non-pastel way and it looks great against my pale skin. In terms of the smell, well I have to say I was slightly blown away by it, it smells amazing! As soon as this is applied to your nails a gorgeous scent floats around you that is actually surprisingly strong, but not in a bad way, in a you can actually smell it way. I was also surprised that you can still smell this through a top coat, but obviously this doesn't stick around for that long, it does fade reasonably quickly. I painted my nails late on in the evening and could smell this as I was going to sleep that night, but by the morning it had pretty much gone. So these might be good ones to go for if you're going out for the evening. 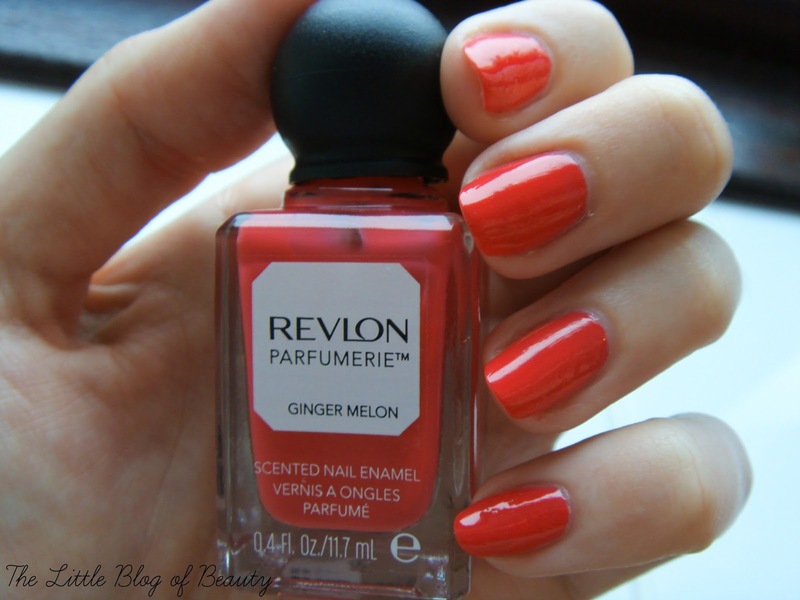 The Revlon scented nail enamels are split into a few different scent groups and this one falls into the fruit and floral group. At first I thought this has a very sweet artificial sugar kind of smell (India described it as like Haribo sweets) but now actually I think it's more like a lightly spiced watermelon smell, so I guess Ginger Melon is the perfect name. Am I in love with this? Yes! Do I want more of them? Hell yes! I've got my eye on African Tea Rose, China Flower and Bordeaux. 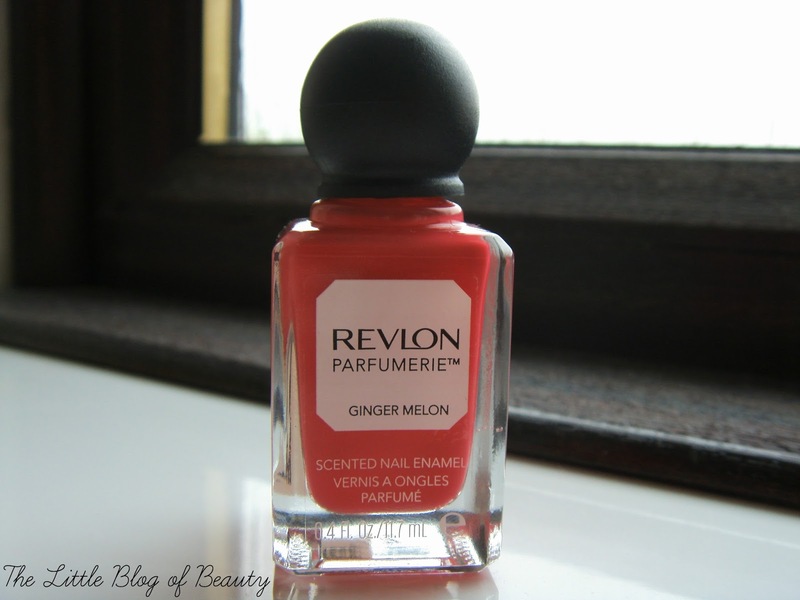 Revlon Parfumerie scented nail enamels are £6.49 each and are available from Boots. Have you tried any of the Parfumerie nail varnishes? I agree the packaging is lovely! I think I definitely need to pick some of these up! Your right even if it didn't have the whole scented angle. I'd still be interested in just the packaging itself as it's just soooo pretty!